Since the birth of her daughter Krystal in March, Shirley Yeung (楊思琦) quickly lost the baby weight in order to return to TVB and earn “milk” money. After battling postpartum depression and facing a myriad of negative press, the 34-year old former Miss Hong Kong is struggling to find a balance between being a single working mother while taking care of her parents and baby Krystal. Shirley reportedly had to increase the dosage of her anti-depressant medications and dropped another 20 pounds, causing her to look extremely thin recently and raising concerns over her health. Although Shirley ascended to leading TVB fadan shortly after winning the Miss Hong Kong crown in 2001, TVB executives were not thrilled with how Shirley handled her public breakup with Gregory Lee (李泳豪) and tumultuous relationship with Andy Ng (吳帥) last year. For the first time in 11 years, Shirley is not featured in the 2013 TVB calendar as she is no longer favored by the company. It is reported that Shirley is losing out on family friendly commercials and spokesperson opportunities to new mother, Sonija Kwok (郭羡妮), who has since freed herself from her previous vixen image since giving birth. The Comeback Claim <翻叮一族> from 2 years ago was the last TVB series that Shirley starred in. Shirley has no choice but to seek hosting gigs in mainland China. 20lbs? where the heck do you find those fat in her to lose it? she’s just gonna be skin and bone. Sad! She gave birth? Who’s the father? The father of Shirley’s daughter is ex-diver, Andy Ng. The pair allegedly broke up at the beginning of the year, right before Shirley gave birth. The breakup reason is unclear, in which speculations range from Andy owing large financial debts to him being engaged to another woman and unable to marry Shirley. She never admitted that Andy was the father…leaving reporters to speculate that the baby may not even be either Andy or Gregory but a third person! It is weird that Andy suddenly dissappeared after Shirley gave birth…if the baby was his, i’m sure he would want to see the baby. She never told the public who the father of the baby is. Poor Shirley Yeung! I hope she will feel better soon. Since she has decided to be a single mother, she will have to accept the aftermath. Just think about her future and forget about the past. As long as she’s still alive and living on the face of this earth, she still has her chances of picking up her career again is never over…she’s 34 and has a baby daughter to take care of, im sure that’s enough to be her main motivation in striving to safe her career no matter what. She is still very young and should be able to pick herself back up and the main driving force is her daughter. Mothers have an innate force in them to care for their children no matter the circumstances. She can be the next Rebecca Chan Sau Chu who also brought up her son on her own and never revealed the identity of the father. I don’t applaud how she handled her personal affairs with Gregory and Andy but now that she has a daughter I truly wish her the best and hope that she can start fresh again. That said, I’ll wish her all the best. Hoping to see her in TV soon. Maybe expand to Mainland. She’s very pretty and talented so she’s bound to get interesting roles. She probably wants to stay in hk to be w/ her baby. Shirley still looks pretty so hopefully tvb will give her more chances. Maybe she can get a hosting gig on a show like “scoop”. I can only see her doing hosting/adverts in mainland (if she’s lucky and if her Mandarin’s good). Starting over at age 34 doesn’t seem viable for actresses in particular, especially one that wasn’t even popular in Hong Kong to begin with. Um this woman hasn’t been promoted since like 2006. When was her last leading role? I can tell you that, it was 2006 The Price of Greed. Pretty much when the new Miss HK’ers and Miss Int’s came flooding through, like Linda, Fala, Kate etc, she lost momentum and sadly, couldn’t catch up to the rest. Shirley must quickly stop feeling sorry for herself before she gets into deeper depression out of which she will find it most difficult to get out if she’s not strong enough to do so. She should think of her baby and that should spur her to get out of the more she’s in. Jayne, she is miss hong 2001….maybe you would like to change that? Miss hong 2004 is Kate Tsui. Anyway, i feel symthetic for shirley…poor girl! A single mum and has to take care of everyone. Add oil shirley! I think her career went down after 2007 after she starred in her first villain role in The Brink Of Law none of her roles stood out. I thought that was her best performance yet in TBOL, she was def favored. Then in 2009 she was in A Chip Off the Old Block though her role was nothing special she was still one of the female leads. I don’t think she’s a great actress but she does have her talents, I think she should be given more complex roles rather than those who whine too much or those who have a goody image. Her personal life should have nothing to do with her professional life we have no right to comment in her personal affairs no matter who was right or wrong. It was already explained that her daughter is too young so she wants to spend more time with her and focus on hosting for now and acting later on its no big deal. But for celebrities, it is hard to seperate personal and professional life. Media will hound on you and audience wants to know too. For celebrities no but it is the media thst wont let it go, they want to know everything just to write for ppl who are nosy. Nothing in your personal life should affect your abilities as an artist. It’s like saying if an artist dud have an affair which means that artist is not talented in acting/singing. Those “fans” who turn against that artist are hypocrites cause you’re a fan of am artist for their talents and abilities in the industry not what choices they made in their personal lives we have no right to judge them. HK media is by far the most ridiculous ones compared to the others…they make up the most ridiculous stories and asks the most dumb questions. Shirley is paying the price for her indiscretion and the fallout that came with it. The road ahead will be difficult but her career can be salvage if she cleans up her act. She should take care of the newborn and raise it for 10 years and when the young one is more mature to handle mom working as a single mother while mom is letting the negative press die down and mending fences with TVB if she choose to stay with them. Coming back at 44 is not all that bad considering that Michellle Yim who is much older is doing well. Of course, she can go over to other stations to keep her face time on screen current though she make incur a paycut. Some work is better than no work. Hopefully, she will mature as a person versus a spoiled brat and realize not to take things for granted or overestimate one’s self worth. you know sire ma is the new shirley……..
No. sire ma is sire ma…shirley is shirley. They are totally different… How can you compare??? I hope TVB will give her some roles to act to rebuild her image and acting career. It will also help her get out of her depression if she has some solid work to do. If she decides to stay in the entertainment industry, she will have to forget her past. Just work hard on her acting skills and rebuild her image and career. People will not pity her; she has to do it herself. It’s always tough to be a parent but let alone a single parent and caring for “scrutinizing” parents as well – that’s even tougher. Good luck Shirley. Just wait for a few years, she’ll become relevant again. Maybe this is a way of TVB lowballing her salary. What are the chances that CTI will scoop her up? Since the delay of its broadcasting license, CTI may be considered to be a risky move by certain artists. Some veterans went over for more money, but popular artists still choose TVB for the greater side income from promotional events. Hosting gigs is not necessarily bad for Shirley. She just needs to carve out a niche for herself and become very, very good at what will bring in the money. Acting is not really her forte, so hosting can provide a steady stream of income. She also need to regain composure when in front of the media. Losing her cool in regard her “depression” isn’t going to endear her to possible sponsors. She can write a book and reveal who is the father. She’ll make lots of money. Isn’t the father Andy Ng? Krystal looks just like him. unlikely…people don’t want to buy a book just to find out..they can search the internet when the book come out. I’ve never been a fan of Shirley, not because of her high profile relationships but because of her acting skills. She’s not the most terrible actress in TVB but she was playing leading roles and I didn’t think she deserved them. However, I do think she’s pretty and it’s sad to see her struggle. For the sake of her baby, I hope she’ll be at a better mental state soon. Life in the circle is just harder than many other fields if you don’t have the luck,timing,connections,etc… You can be hardworking and talented but still end up nowhere…There are ups and downs that we all experience so I hope that Shirley will be strong for herself, her family and her baby. We females when an error crops up guess who is burned the most? Live & learn. Poor Shirley..
It’s disappointing because I think TVB gave up on her way before the Andy-Gregory fiasco. She had only one or two series in the one-two years before that, and it was playing supporting and third supporting characters. For an actress that came out playing first lead, then moving to third supporting, that must be a terrible feeling, but she still expressed that she wanted to act in series, but it seems TVB never gave her more opportunities. If she had worked more, then she may not be where she is today. I’m not blaming TVB though because it was her choice entirely in the Andy-Gregory, single mother decisions. She’s not the only one who debuted as lead but ended up getting supporting roles later. Anne Heung was also the same. Anne was supporting in ‘Seed of Hope’ and DIF4 and also some other series I couldn’t recall at the moment. Can’t blame TVB though. She made absolutely no improvement in her acting and speech. Always that overeager cutesy act. Her voice is still as shrilly as ever. Recently, Shirley was in a TVB commercial about 3d television broadcasting that they are testing out. The same old, same old. Just reminds me of how much I dislike her acting. 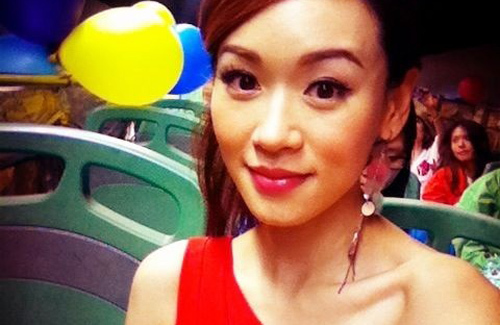 Shirley Yeung got dumped because of her love life with Gregory Lee, which was disapproved by TVB. Gregory was only a kelefe and his relationship with Shirley Yeung had downgraded Shirley’s 1st lead status. TVB wanted her to dump Gregory and she refused and made high profiles of her relationship with Gregory. Of course her not-too-good acting also played some role there. this scandal is never gonna stop, in like a couple years, this will once again resurface as hk media will want to compare who the daughter looks like and then dig up shirley’s grave again. I feel so bad for her…. Me too…but once a person steps inside of the entertainment world, it is forever. There is no quiting nor turning back once you are a known figure, whether big or small. .
would be without my husband. your baby reach a milestone. I hope she will get more opportunities and stay strong ! Go Shirley! Even though I was never a fan of her acting, I pray that she could adjust to her new life well. Her daughter needs her. I also wish the press would be kinder towards her. *Applaud* I hope she learns from everything, and move forward, but look at on the step that she have taken. As a single mother whose will also support her family, I hope her the best. And some people need to learn “do not kick a dog, when its down.” She can definitely improve her acting skill, I’ve seen it. @Shirley, you need to take the 5 stages and goes through it. still cant believe the fact she had a live in relationship w/the gregory dude and live in w/the whole family for almost 10 years and this happens. good luck as TVB certainly does seem to promote newly out of the microwave MR HK’s since shes practically like a veteran she might be lucky to even get cast as future supportings. yes, its a world we live in but it’s called ‘REALITY’.